Everything was said twice at English camp. Everything was said once in Czech and once in English, from announcements at breakfast to the Evening Program. It is an English Camp but because the high school kids at the camp had varying levels of English experience having both languages constantly spoken eased the skill level differences. And I must say, all of the translators did an amazing job! 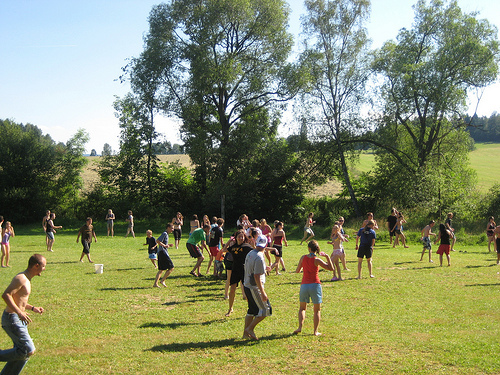 The Strakonice English Camp is the largest of the 21ish JV Czech Summer English Camps with 105ish people total, again, the majority being the high school kids. The high school kids who sign up for these English camps know that the camp is sponsored by Josiah Venture and that during the evening programs they will hear Bible stories. My guess is that more than half of the students who attend the camps are not Christians. Thanks to Leah, our mornings would start with a hot pot, french press, and (thanks to Dexter) a bag of fresh roasted & ground Brazilian Roast Coffee from Capanna Coffee. Then we would leave a note for our sleeping kids & go to a morning time of devotions, worship, prayer and info for our day ahead. This was always a refreshing time, even during the one morning they gave us off from meeting, ;)! The JV Team / Staff was made up of an assortment of people. First, there was a full time JV missionary, Leah! Then, there were JV Summer Interns who had committed to spend 3-7 months in Czech running summer camps, we had 4 from the states and 3 from Czech at our camp. Then, there was a church team, our camp's church team was from Cherry Hills Community Church in Denver. They brought with them a team of 4 adult leaders and 8ish high school students (not to forget 4 cutie little kids). I love the fact that JV purposefully has American teenagers reaching out to Czech teenagers in their summer camps. It is a brilliant and effective setup! Then, there is a group of Czech nationals, some are translators, some are kids who go to the school year English camps, some are seasoned Christians and some are young in their faith but they all have a heart for the lost. By 8:30 we would go back to wake the Three from our room and take them to breakfast. At 9:15 the whole camp would meet and they would watch a 5 minute music video that told a story. The theme of the camp this year was "Redeem." Each video, story, question, and the camp theme song revolved around redemption. The stories they shared in the evenings tied into these morning videos as well. Immediately after the video the students were dismissed to their English Classes. The camp was divided into 10 classes of 10 people each. Each class had an American teacher, Czech translator, American teenager and maybe an additional Czech Christian or translator. Zeke went to the English class taught by Leah, Josh assisted in a class taught by a leader from the Cherry Hills team named Ragu, I taught an English class that Max would sometimes come to, and yep, Miriam played with a babysitter & the other missionary family kids during English class. English class would start with a journal time where they would answer questions about the video and then it a a full blown English class that lasted 3 hours long, right up until lunch. At 12:30 was Lunch followed by Free Time. Most days the little kids would play in the creek while the students would go swimming or play soccer or board games. One day they had separate VIP Girl's Time and Man Hour. The girls sat and did nails and massages while the guys beat the snot out of each other playing this incredibly violent game called Viking Football. Every single guy who played this game had scratches and bruises and stains and cuts and aches. Josh ended up knocking a guy out and in return got a HUGE gash on his shoulder along with many other wounds. Every single guy LOVED playing the game. By 3:30 it was group Sports Time, which the older little kids would participate in as well. The entire camp was divided into (I think) 8 teams complete with team names and team dances. During Sports Time they would compete at a variety of games, most were goofy like dodgeball with finger darts or more sportslike with basketball shoot offs. The last full day of camp is always Water Day. 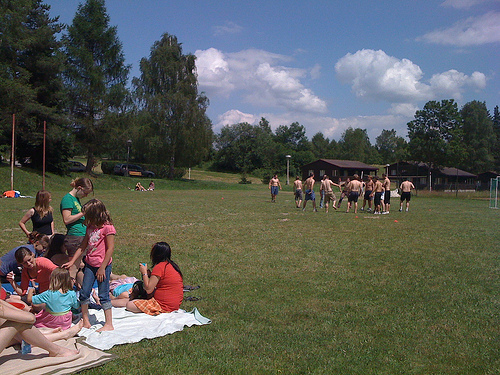 Every "sport" is a water sport from Duck, Duck, Goose with water to Freeze Tag with water, to the concluding ultimate water balloon fight with near 1,750 water balloons. At 6:15 most people were starving for dinner and by 7:30 it was time for the Evening Program. The Evening Program always started with songs with hand gestures led by Leah and Janu (sp) one of the Czech Summer Interns! Whoo hoo! That was a fun time! As the last song we would do the camp theme song and dance, "Never Going Back to OK." (At this time Josh would put our kids down to bed and be back in time for the story.) As a transition into the story there was a great skit organized by Eva, another Czech Summer Intern. Then the speaker would come up and share a story from the Bible about redemption. Based on the theme for this year, the Bible stories were tied together through the family tree of Jesus; stories about Rahab, Judah, Ruth, David, Jesus himself, and the last night was a series of many testimonies of redemption and I got to be one of those testimonies. Near 9ish, whenever the Evening Program would end, we would break down into our English classes for Discussion Time. During Discussion Time we would go over questions about the story told that night. This was one of my favorite times of our day! The 15-16 year old kids in my class had amazing and genuine questions, most were incredibly deep and thought provoking. My Czech kids were really chewing on some heavy duty topics, and never stopped asking questions to find their answers. Around 10:30 the discussion would wrap up and games would be played, more talking would be had, but sooner than later, I was heading to our room to check my students' journals, get my lesson ready for the next day of class, and get myself ready for the new day that was now quickly approaching. Phew! Thanks for posting about your trip! I've enjoyed reading the past few days! It sounds amazing.